Toys are important for adding enrichment to your rats’ lives. They keep them entertained and active throughout the day, which is important for their overall happiness and well-being. You can find a toy to suit every need, whether it is climbing, chewing, burrowing, or encouraging focus. The best rat toys can be purchased online or locally from most pet stores. If you are feeling creative, you can even make your own toys! What Makes A Good Rat Toy? Before picking out some new toys for pet rats, think about what they seem to like to do the most. For example, rats are naturally inclined to chew, so it might be a good idea to stock up on a variety of chews for your mischief. Or maybe your rats are energetic and could benefit from having an exercise wheel in their cage? The possibilities are endless. When picking out a new toy for your rats, it’s important to ensure that it is safe to chew. 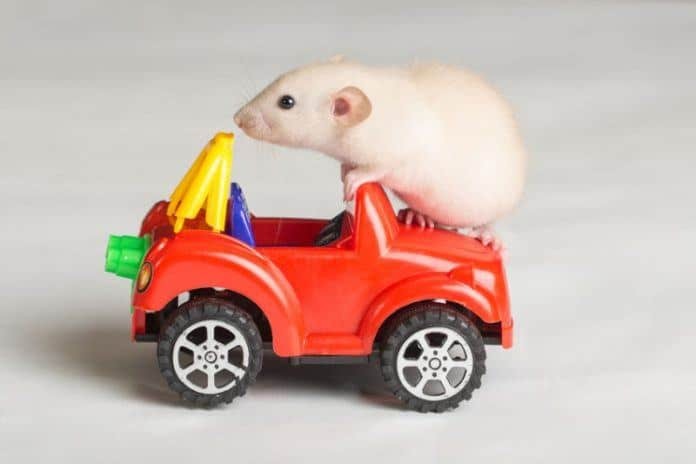 Rats will try to chew everything, so you’ll want to stick with toys that have been painted with food-grade food coloring and won’t damage their teeth. Additionally, you should avoid fabric toys that become stringy when chewed. Finally, avoid toys that your rats could get trapped in, or could injure their tail or feet. Pet rats keep their teeth trimmed by chewing food and toys, so you should keep their cage stocked with wooden chews at all times. Kaytee Perfect Chews are popular because they’re inexpensive , rats love them, and they’re good quality so you don’t have to worry about them falling apart the first day. This toy is a good choice for rats because it offers a bit more of a challenge than the Kaytee Perfect Chew. 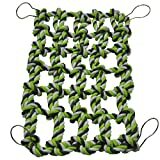 Instead of hanging, this toy can be left anywhere in your rats’ cage for your rats can explore freely. It won’t take long for them to discover that there is a hidden treat inside! Rats are naturally inclined to burrow and hide throughout the day, so a tunnel is a great toy to include in their cage or during supervised playtime. The Ware Fun Tunnel is a good choice because it is long (2.5 feet) and flexible making it easy to change its shape and enhance your rats’ play. Don’t be surprised if this tunnel transforms into a bed throughout the day too! 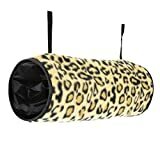 This tunnel might be marketed towards ferrets, but it will work great for your pet rats, too! At 8 feet, it’s substantially longer than the Ware Fun Tunnel, so it’ll work well for playing outside of their cage. Another nice feature about this tunnel is that its transparent so you can see your rats playing inside of it. Exercise wheels are fantastic for encouraging exercise and helping energetic rats burn off some steam. Not all exercise wheels are safe for rats though, feet and tails have been known to get stuck or injured while using wire exercise wheels. 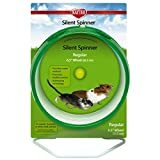 The Kaytee Silent Spinner is perfect for pet rats because it has solid construction and isn’t as noisy as most wheels. It comes in a few sizes, but you’ll want to get the Large (10”) size for most rats. Anyone who has experience with pet rats knows how smart they can be. 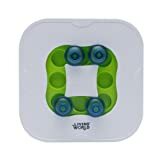 A good way to encourage an active mind is to offer puzzle toys like the Living World Teach N Treat. You use this toy by hiding treats in different compartments and letting your rats figure out how to remove them. It usually doesn’t take long, but your rats will get a kick out of it every time. Easily connects to most pet cages with metal clips. Dimension: 13.4 inches in length and 8.3 inches in width. If your pet rats are big climbers, this is the toy you’ll want to have in their cage. It can function has a hammock or as a hanging climbing rope, either way your rats will probably enjoy it. A problem with some hammocks is they are easy to chew and get destroyed easily, but the Niteangel Small Animal Activity Toy is higher-quality and durable, so your rats should get more playtime out of it. If your rats are anything like mine, they will enjoy playing and napping in the Ware Fleece Hang-N-Tunnel Crinkle Sleeper. It’s covered with soft fabric and offers privacy for naptime and hanging out. It’s easy to clean, just throw it in the wash and let it air dry. 1. Material: Made of Natural Wood, Non-toxic, harmless and durable. 2. 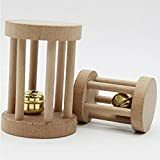 Pattern: Cylindrical Wood Roller with Bell, It will make sound when your pet play or bite it. 3. Function: Gives your small rodent the perfect opportunity to play and work out. 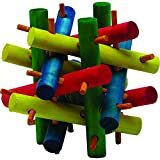 Your rats will enjoy chewing this natural wooden toy and rolling it around their cage. If you’re worried about your rats chewing painted wood, this is a good choice because it’s completely natural – no paint to worry about at all. To keep your rats’ interest, there is a bell inside the toy that will be heard while it is being pushed around. It should be removed from the cage if it falls out of the toy to avoid hurting your rats’ teeth, but it is safe entertainment until then. As the old saying goes, some of the best things in life are free. Cardboard boxes are no exception, your rats will have a blast exploring, hiding, and chewing any cardboard box you give them. If there is any color on the box, check to make sure it was done with soy-based ink before giving it to your rats, and remove the box once it becomes too wet and smelly. Also, avoid boxes that have staples or other sharp areas on them, as these can be dangerous! Pet rat toys are important for adding enrichment and fun to your rats’ lives. It’s recommended to have an assortment of toys available to keep your rats interested throughout the day. Don’t forget to ensure that toys are non-toxic and free of choking hazards before leaving them in your rats’ cage. Litter Box Training For Rats: Is It Even Possible? Sexing Baby Rats: Boy or Girl?